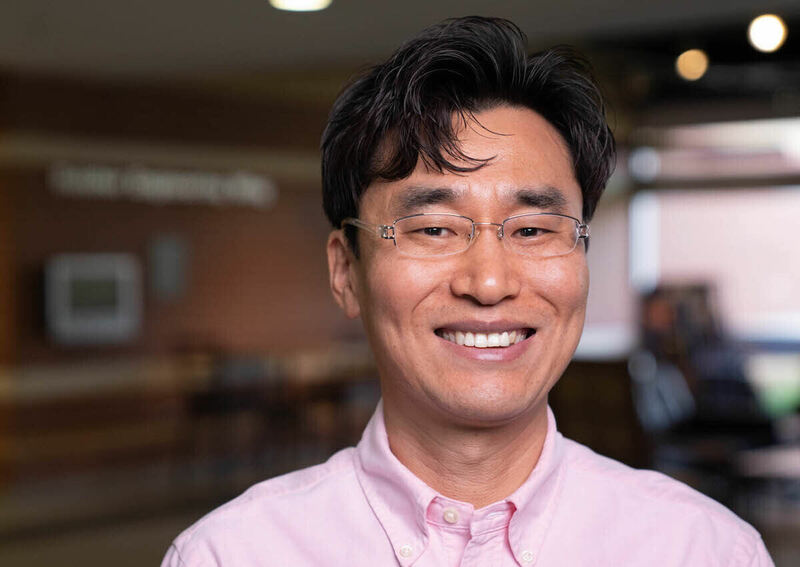 My name is Dr. Joon Wan Kim, and I am a professor of electrical & computer engineering here at LeTourneau University. I grew up in Changwon, South Korea. I loved living in Korea, but growing up, I was captivated by American movies and music and was fascinated by American culture. I knew I wanted to move to America, and in 1994, I did just that. I had just married my beautiful wife, Sophia, an art major who went to the same undergraduate school as me in Korea, and started graduate school at the University of Alabama, Huntsville. Leaving home was difficult for both of us. However, we were blessed to find a wonderful Korean-American church in Alabama that, through God, gave us determination, community, and life-long friends. During this time, Sophia and I both strengthened our relationship with Christ and a few years later, Sophia and I started a family. My son Robin was born in 1996 and my daughter Jenny was born in 1999. Looking back, this was the most difficult time in our lives. Sophia and I were in a foreign place trying to learn a new language, raise a family, and get through the stress of earning my PhD, but God was with us every step of the way and through Him we persevered. I graduated with my doctorate in 2003 and came to Longview, Texas to begin working at LeTourneau and I have loved it here ever since. My children both attended Spring Hill ISD and Robin is now about to graduate from Rice University and pursue an electrical engineering doctorate of his own and Jenny is a pre-med student at Brown University. Sophia and I got our American citizenship in 2014 and we both feel that we have truly achieved the American Dream. Teaching at LeTourneau has been such a blessing. The environment here is so close-knit and caring. Everyone feels like family. Because of my journey, I care deeply about providing this blessing of Christian community and education that LeTourneau provides here in Texas to students all over the world like in Korea, China, Mongolia, and more. Hardware implementation of an Adaptive Noise Canceller. Performance analysis of the Self Correcting Adaptive Filter and the adjusted step size NLMS algorithm. Adaptive filtering based on variable step size and signal to noise ratio. Hardware implementation of an Adaptive Noise Canceller in an automobile environment Boo-Shik Ryu, Joonwan Kim; Proceeding of the IEEE Electrical Design of Advanced Packaging and Systems Symposium, Seoul, S. Korea ,10-12 Dec., 2008. The Performance of an adaptive noise canceller with DSP processor Boo-Shik Ryu, Joonwan Kim; Proceedings of the IEEE Fortieth Southeastern Symposium on System Theory, University of New Orleans, LA., 16-18 March, 2008. Implementation of the Embedded System Using the AD code and TTS Si-Woo Kim, ,Joonwan Kim; Proceeding of Korea Information and Communications Society, 23-26 Aug., 2007. Performance analysis of adaptive noise canceller in real-time automobile environments Joonwan Kim, Chae-Wook Lee; Proceedings of the IEEE Thirty Ninth Southeastern Symposium on System Theory 04-06 March, 2007. Comparison of adaptive systems for noise reduction in speech Joonwan Kim; Chae-Wook Lee; Proceedings of the IEEE Thirty Eighth Southeastern Symposium on System Theory 05-07 March, 2006. Performance analysis of the Self Correcting Adaptive Filter Joonwan Kim; Eric T. Perry; Proceedings of the IEEE Thirty Seventh Southeastern Symposium on System Theory 20-22 March, 2005. Performance analysis of the adjusted step size NLMS algorithm Joonwan Kim; Poularikas, A.D.; Proceedings of the IEEE 36th Southeastern Symposium on System Theory 14-16 March, 2004.